Today being Valentine’s Day, the day of Love, Passion, Romance, and nothing is associated with the air of romance than the sound of strings – and above all the soprano tones of the violin. The violin is an absolute cornerstone in music setting out to convey these feelings, and even where music is not written for the violin most romantic music is subsequently arranged for the violin or to feature strongly the violin in a group production. We then have the classical ‘Romance’ written for violin and piano or violin and orchestra. And there are plentiful examples of Romances that are less well known but deserving of a more prominent place in the repertoire and our conciousness. And who has heard of the wonderful Romance for violin and orchestra by Fini Henriques…who? Yes, do check it out! Beyond the Romance there are many other pieces from the standard violin repertoire that conjure feelings of passion fit for any romantic setting and the wooing of a loved one, take for example Tchaikovsky’s Serenade Melancholique and Bruch’s Adagio Appassionato. You could start and end with that piece it is such a powerfully evocative piece, and yet still it is very under-represented in the repertoire. In both cases the soloist is Salvatore Accardo performing with the Leipzig Gerwandhaus Orchestra under Kurt Masur. I am just going to draw attention to a couple of stand out pieces here from a vast array. That must have been quite some dream that Faure had to wake up with the inspiration to write such a piece! And it doesn’t end there….. The patron saint or patroness of musicians is St. Cecilia, whose feast day is celebrated on the 22nd November each year, but who was she and why did she become the saint for musicians? Cecilia it is held was a noble lady of Rome whom live in the 2nd or 3rd Century and her feast day has been celebrated since as early as the 4th Century. She was married to Valerian and it is said that she ‘sang in her heart to the Lord’ as musicians played during her wedding ceremony. This seems to be the connection to music that has led to her becoming the patroness of musicians. Further, the story goes that when the time came for her marriage to be consummated she told Valerian that there was a guardian angel watching over her who would care for him if he respected her virginity but if she was violated then he would be punished. When Cecilia was asked to show Valerian this angel watching over her she told her husband that it would appear to him if he were to go and be baptised by Pope Urbanus at the third Milestone on the Appian Way. The legend of Cecilia’s martyrdom follows that she was made a martyr along with her husband and brother by way of the sword; and that having been struck three times on the neck she lived for a further 3 days and that she requested that the pope turn her home into a church. Thus stands the Church of St. Cecilia in Trastevere on the site of what was reputedly her home. The original church was built in the 4th Century and rebuilt in 1599. Cecilia’s remains had been moved to the church in the 9th Century and when the church was rebuilt over 700 years later it was found that her body was incorrupt. She is the first of the saints to be discovered incorrupt. She also has one of the oldest music institutions in existence named after her, The National Academy of Santa Cecilia, founded in 1585. St. Cecilia’s influence follows through into contemporary ‘pop’ music, the best known example being Paul Simons’ song “Cecilia” which appears to refer to her in the context of the difficulties encountered in writing songs…”Cecilia you’re breaking my heart, you’re shaking my confidence daily”…and ends “Jubilation, she loves me again, I fall on the floor and I’m laughing”. The next time you have a block with your music, maybe try calling out to St Cecilia! 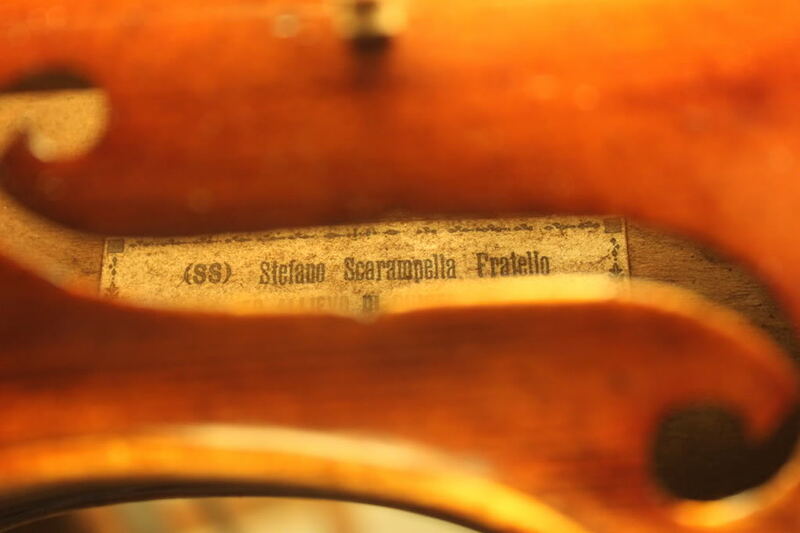 When we think of the violin making greats the names that first spring to mind inevitably are those originating from Cremona: Stradivarius, Guanerius, Amati and the likes. After this one of the most important centres, and what subsequently became known as a ‘school’ in its own rights, was Milan. Of the violin makers establishing themselves there the Testore family is one of the outstanding names. 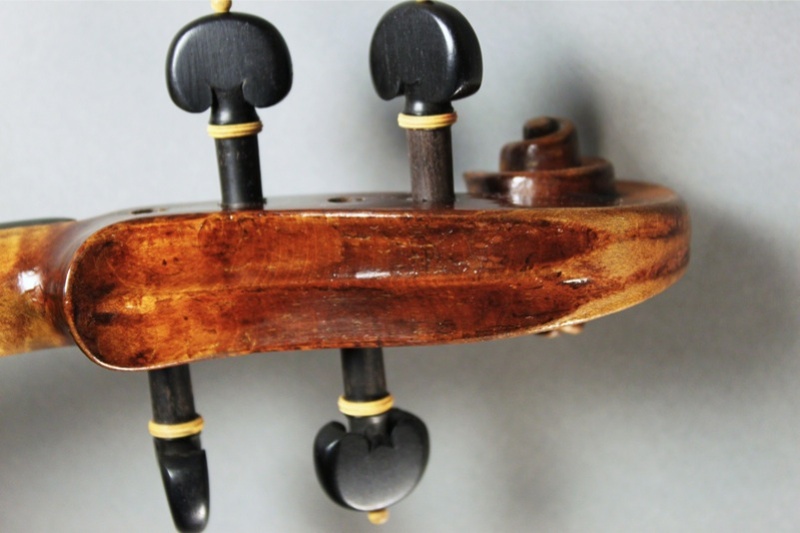 In the early 1700’s they competed admirably for quality of workmanship with the violins being made in the Cremonese, Brescian, Neopolitan and Venetian schools. However, like all of these, throughout the next few generations of violin makers there was a remarkable fall in standards. These are clearly evidenced in the successive generations of the Testore family. 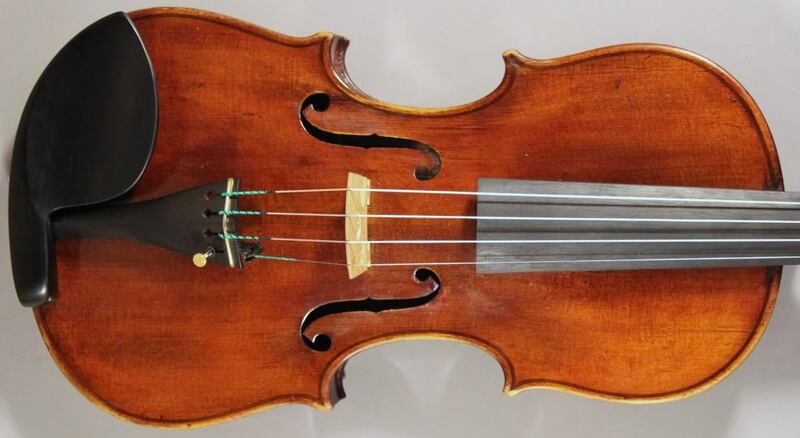 The first violin maker in the Testore family was Carlo Giuseppe Testore. He earned himself a very high reputation working in Milan from his ‘Sign of the Eagle’ workshop. 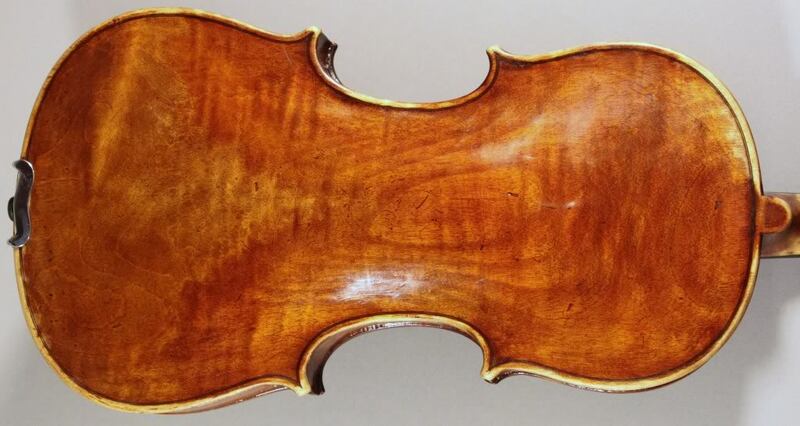 Carlo leant his trade from the eminant violin maker Giovanni Grancino, who himself had been taught by his father Paolo Grancini a student of the Cremonese genius violin maker Nicolo Amati. According to Henley’s Universal Dictionary Amati thought extremely highly of Paolo Grancini, stating “…that genius considered him to be one of the most gifted in his workshop”. 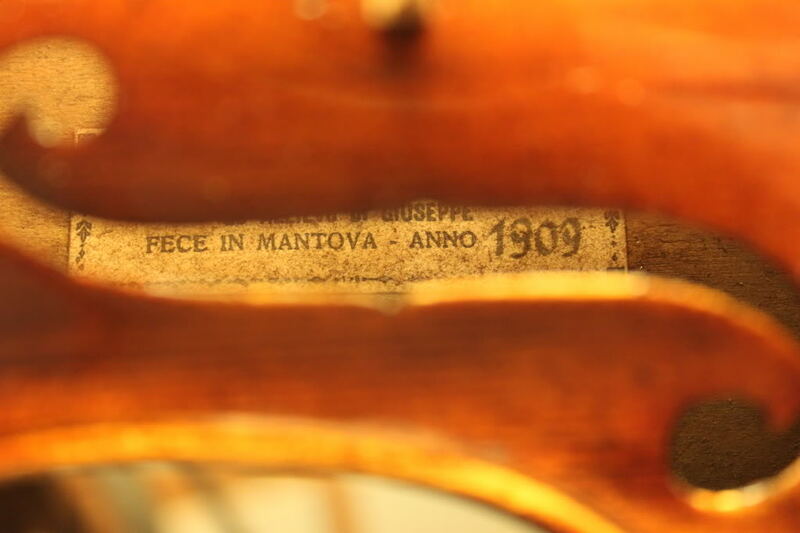 The instruments of Giovanni closely followed the Amati pattern initially but from 1709 onwards his violins were refined into what became known as the recognisable Milanese style. Giovanni work is even regarded as surpassing that of his father’s, which Amati thought so highly of. Sound holes are well developed and of Stradivarian style. Carlo Giuseppe Testore strove for this same level of excellence, with some regarding them as barely distinguishable. Both have a strong Amati influence.The arching is less profound and is subtly shaped. They are much sought in today’s market being gracefully elegant and having a great charm to them. Carlo Giuseppe Testore died in 1716 leaving two sons who had followed him into the trade. The elder was his 23 year old Carlo Antonio who had become a fine craftsman in his father’s mold and inherited the running of ‘The Sign of the Eagle’. The younger brother, Paolo Antonio Testore, did not distinguish himself as his elder brother did when it came to violin making. Paolo’s violins were much more hurried affairs, cutting corners where he could especially on the refinements of appearance. That is not to say that they were still very soundly constructed. His own son Pietro Testore allowed standards to degrade still further but despite having the somewhat dubious accolade bestowed on him by the authors of the Grove Dictionary of Music as “possibly the clumsiest pair of hands that ever made a violin” his violins are still very much instruments that are gratifying to play upon; with good tonal qualities, resonance and power. Even by the time of Carlo Giuseppe’s death, and increasingly so in the years that followed, the violin makers of Italy were under increasing pressure from a combination of the economics of the time and in particular an influx of the German violin making factory. Their ability to produce large numbers of much cheaper instruments meant a drop in the price that many Italian makers could demand and hence the need to work faster and using inferior quality materials. While Carlo Antonio was very measured in where he made these economies Paolo and his descendant were markedly more susceptible to succumbing to such pressures in ways that their elders (and the Cremonese master makers) would never have entertained. The wide respect and appreciation of the violins that Carlo Antonio produced is as a result of their fine tonal qualities. These are ensured by his conformity to the overall pattern of the violin, with consistency to outline and arching. The soundholes are gracefully carved and open. His trademark touch however are his fine scrolls to which he obviously gave much time and attention. 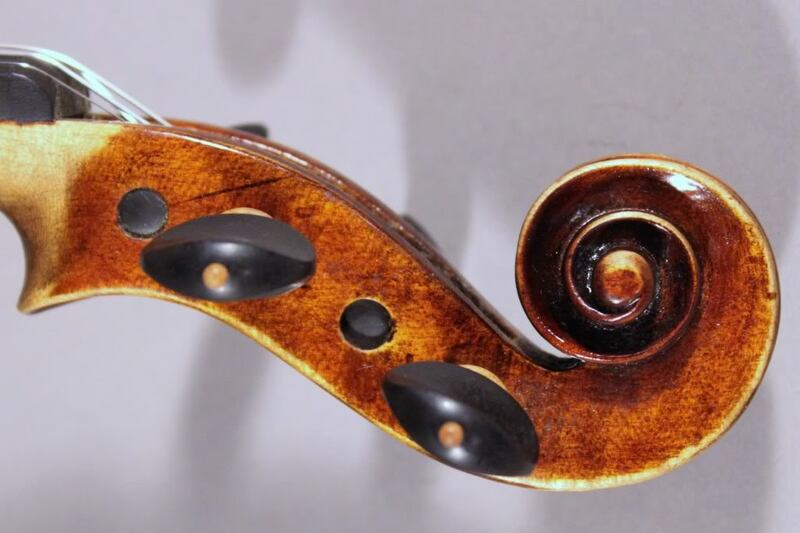 The concentric spirals are those of a master violin maker, with highly distinguishable features being the flaring front view and the corners of the plates slightly pointed. Carlo Antonio’s younger brother, Paolo Antonio, on the other hand was much less fussy about appearance and would commonly take shortcuts such as not carving the back of the pegbox with the usual fluting those of Carlo Antonio himself were carefully crafted and typically show little evidence of gauging. 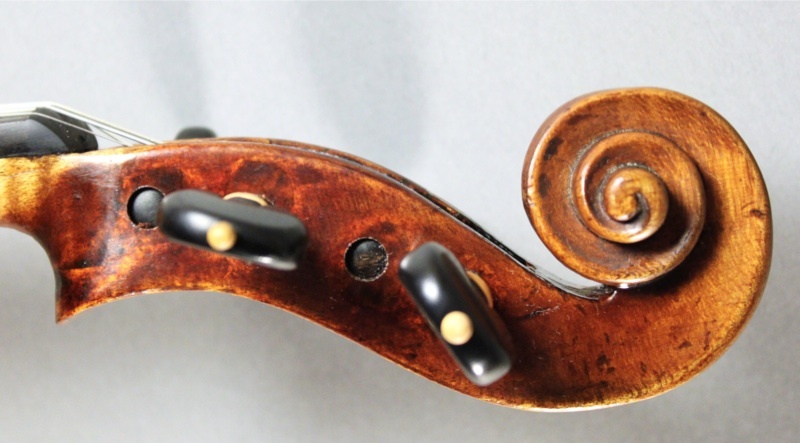 The purfling on a violin is dark colour trim around the outside edge of the front and back. Whilst it is a decorative feature, this thin band of wood set inside a channel carved just in from the rim also served the function of preventing any small cracks starting at the edge from spreading to become a major body crack that will affect the sound of the instrument. Pear wood is the material of choice for the purfling. Its tough, elastic properties produce flowing purfling that evens out any shortcomings in the channel cut for it. 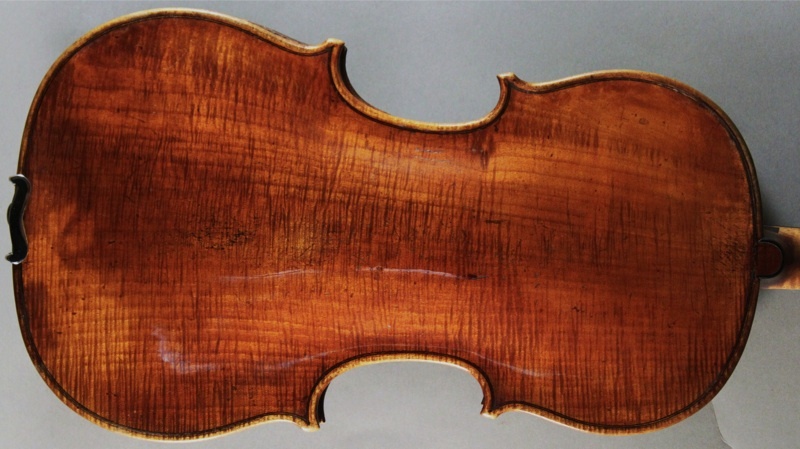 In some of his violins Carlo Antonio used poplar wood for the purfling. Not being as soft tends to crack and distort quite readily. This then highlights any imperfections in the channel cut for it to sit in. Also poplar wood must be thoroughly if it to retain its colour and not fade to a pale grey shade. Carlo Antonio may have used such cheaper materials at times but always remained above replacing the purfling with scratched lines; a shortcut that some later generations were seen to resort as a time and cost saving measure. Carlo Antonio fully displays himself as a true master craftsman in the art of violin making by virtue of the skillful way that he is able to work with inferior quality materials in some of his instruments and make them work in such an incredible way. Although even the top Cremonese makers were at times forced to use lesser material than the preferred clear white maple sourced in the Balkans and to use locally grown “oppio” maple. They would however, always employ specifically nominated tone wood. It is apparent that some of Carlo Antonio’s instruments used locally grown maple and spruce which was intended for other purposes. These woods are closely grained and comparatively hard, some even contain knots, making them difficult to work with. Yet Carlo Antonio still manages to come close to matching the finesse of appearance found in his father’s violins and are far from being inferior in tonal qualities. Carlo Antonio’s violins are undoubtedly extremely fine violins to play and even more wonderful to listen to in the hands of a talented musician. Certainly they may not have the outright power or quite the depth of richness found in a Straivarius violin but they are full, vibrant, colourful and have a remarkable resonance. Consequently they are highly sought after instruments, by not only soloist and orchestral musicians alike, but collectors and investors. They have become a name of considerable repute and today you could expect to pay in the region of $100k to $200k for an instrumen t bearing his name in the dealer shops and auction houses of major cities such as London and New York. To get one for anything less would be a very good investment, not only financially but above all else in terms of the reward its wonderful tonal presence will bring you. 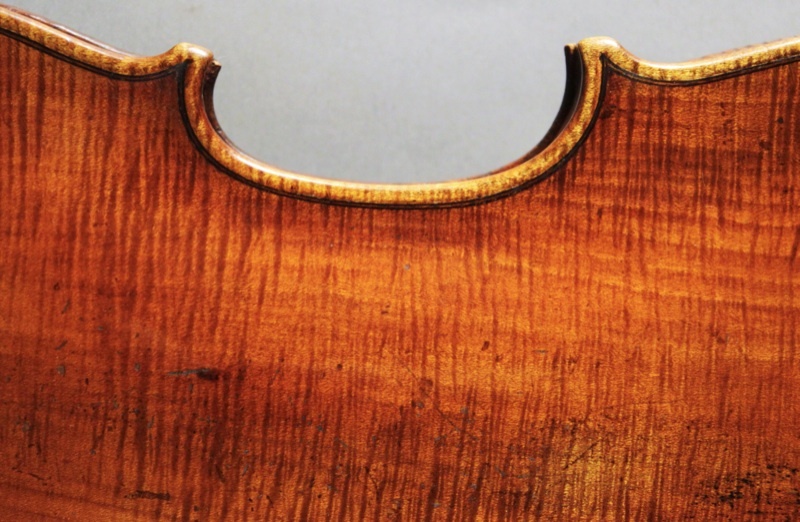 From Carlo Giuseppe through Carlo Antonio to Paolo Antonio and his son Pietro, we see the decline that occurred in the great violin making traditions of Italy that occurred through the 18th Century. Once highly revered as master craftsman with the eye of an artist working to the most stringent standards imaginable and the patience that would grace an angel. By the late 17th Century the productions had declined to a state that led to it being termed ‘a corrupted trade’, which even afflicted that great centre of excellence, Cremona. 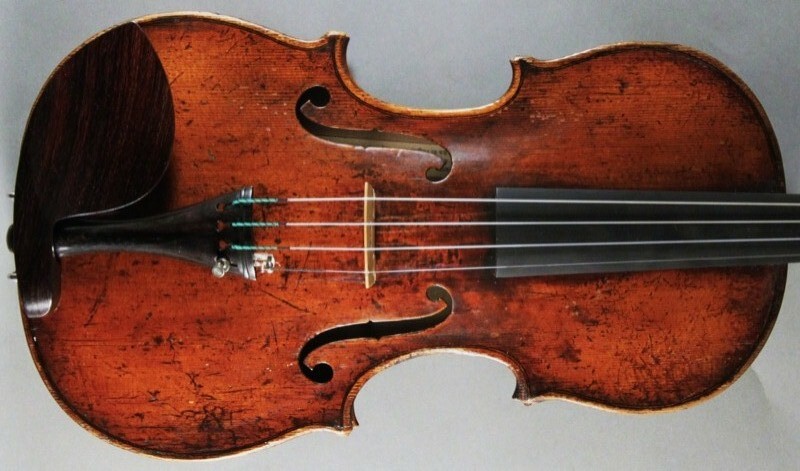 Fortunately for us by the mid-1800’s it had been recognised that the way to compete with the influx of ‘cheap’ German violins was not by a lowering of standards and cutting of costs to try and match them but to return to the ‘old’ high ideals of violin making and the production of the finest violins using the traditional levels of workmanship and artistry present at the beginning of the 18th Century. Some may argue that something of the magic had been irrecoverably lost to antiquity but undoubtedly a few select makers strove to return to the high ideals of their fore bearers and to restore Italian violin making to the once untouchable status it had enjoyed.